On a brutally wintery Saturday morning in New York, Michael K. Williams was holding court with his team over a pot of hot tea at the Crosby Street Hotel’s bustling restaurant. Williams, wearing a cozy Scandinavian sweater, an American-flag scarf knotted around his neck, was seated at a large round table where it was hard to not notice him. People were coming and going. 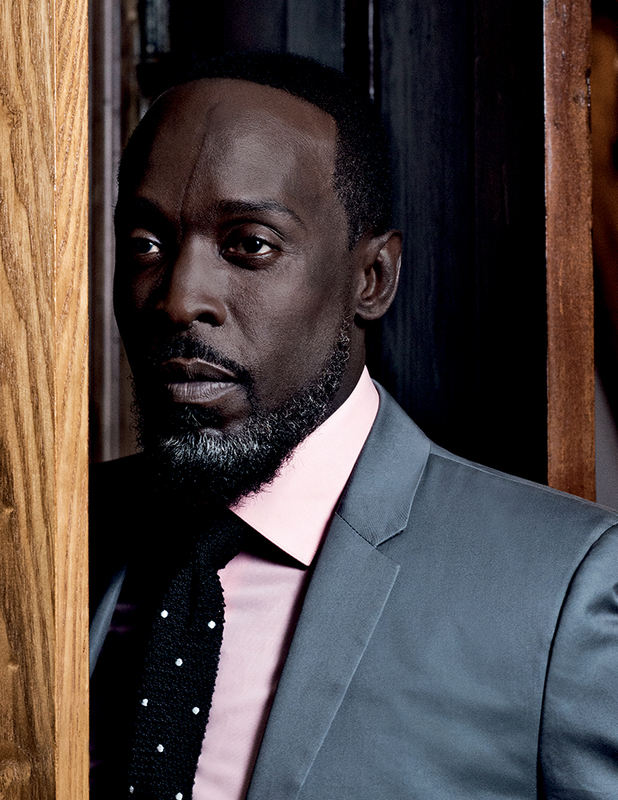 Unlike his two most famous characters, Omar Little from The Wire and Chalky White from Boardwalk Empire, known for their bottled-up menace, Williams is an easy, intimate conversationalist — he’ll touch your arm to make a point — and by late morning, after all this talk, things were running an hour or so behind schedule, the hotel’s lobby sofa doing double duty as his waiting room. Williams took a circuitous path toward being overscheduled in posh Soho, starting out life in the Vanderveer Estates housing project in Flatbush, Brooklyn, and attending the same hardscrabble high school, George Westinghouse, that produced Jay-Z, the Notorious B.I.G., Busta Rhymes, and DMX. He spent stretches trying to find his way as a club kid, community college business major, backup dancer, and, for a few scary years when he disappeared into the cracked-out warrens of downtown Newark, a perilous drug addict. Fellow users knew him only as Omar. And yet here he is, clean, prosperous, and engaged, with a gray-tipped beard. The famous scar that divides Michael K. Williams’s hand-some face in two is, at least in the midday light, even more profound—al-most tectonic—than it appears onscreen. Some guy with a razor cut him on his twenty-fifth birthday, apparently randomly, at a bar in Queens. These days, he lives in Williamsburg. If you want a quick summary of his personal myth, his Instagram handle is @BKBMG, which stands for Brooklyn Boy Makes Good. It’s a slideshow of affirmations (“It is easier to build strong children than to repair broken men—Frederick Douglass”), pop-culture enthusiasms (Cookie from Empire), and celebrity friendship (shots of him at the Selma premiere wearing an “I can’t breathe” T-shirt, posing with David Oyelowo, Questlove, and Aretha Franklin). In the last few years, he’s had roles in 12 Years a Slave, Robocop, and as Rick Ross, the infamous LA crack kingpin, in Kill the Messenger. He’s known Dana Owens, now known as Queen Latifah, since they were teenagers, “just two kids running in the street,” he says. In the mideighties, she’d come in from Jersey, he from Brooklyn, to hang out in Manhattan’s Washington Square Park. “Any excuse to get out of the projects,” he says. “So we met there, and I took a liking to her, and I would always notice that at a certain time of night, she would have to leave, to catch the last bus home across the Hudson.” He gave her a key to his apartment since the subway to Brooklyn runs all night. “So we went from street friends to friend friends, and we were in my apartment one day, smoking weed, and she was like, ‘I’m going to get a record deal one day.’ And I was like, ‘Sure, here, hit this.’” He mimes passing a joint to me across the table, holding his breath to keep the imaginary smoke in. Although he flirted with a less artistic life — at one point even landing a job at Pfizer — Janet Jackson’s “Rhythm Nation” inspired him to become a backup dancer, putting his club-kid skills to work. He danced behind Madonna, George Michael, and Missy Elliott and toured with a bunch of house acts: Crystal Waters, CeCe Peniston, Technotronic, among others. One day, Tupac Shakur saw his picture while he was putting together a movie called Bullet and decided that Williams “looked thugged out enough to be his little brother.” That chance casting convinced him to pursue acting. And then he landed The Wire. The gay stick-up guy Omar Little made him famous, but almost destroyed him, too. “In the beginning, it started out as something healthy, and it turned into something not so healthy. I came from the projects, poverty stricken and angry, with a lot of resentment, and I was taking all of that and putting it into the character, which is why I think it felt so real. I always tell people, ‘Do you have any idea how dark a state of mind I must have been in to portray a character like Omar to that level?’ I was all kinds of fucked up in the head.” When it was over, “I wanted to stay Omar,” he says. black leather braided double wrap bracelet CAPUTO & CO.
Bessie Smith’s story had its ups and downs, too: in the 1920s and early thirties she was the highest paid black entertainer in the world, touring the country in her own railroad car. But she made some bad de-cisions, and had some others made for her by people, including Gee, and died, rather tragically, in a car accident in 1937.